Students, School Staff and Law Enforcement partnered to shock consumers into not buying alcohol for minors. 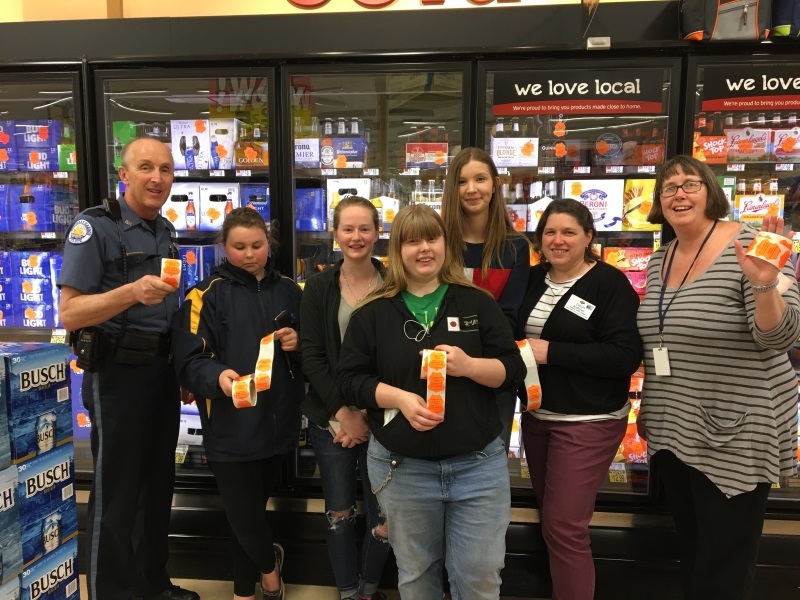 On May 1, students from Boothbay Region High School's Health Advisory Board worked with staff Tammy Blackman and Kacy Pound, School Resource Officer Larry Brown, and local stores to place thousands of neon orange stickers on multi-packs of alcohol. The stickers, provided by Officer Brown, are designed to reach adults who might purchase alcohol and provide to minors, which can result in fines up to $2,000 and possible jail time. Research shows that events like prom and graduation can increase the risk and dangers of underage drinking and driving. In fact, roughly one-third of alcohol-related traffic fatalities occur between April and June. Advise young people that the best choice is not to drink and let them know you're there to help, even if they make a mistake. Ninth grader Maren Whitney said, "Sticker Shock was really fun" as a way to promote safety and reduce underage drinking before prom night. Pound stated, "I had no idea how much liquor was sold at Rite Aid, even though it's supposed to promote health and wellness." The students placed stickers at Circle K, Rite Aid and Hannaford in Boothbay Harbor. Sticker Shock, among other substance use prevention events, highlights how every part of our community plays an important part in keeping young people safe. Providing resources to businesses can reach parents and adults that have a direct influence in helping youth make healthy choices to stay drug and alcohol free.